For questions, comments, or to be added to the prospective camper database, please contact Collins Lowder via email by clicking here or by phone at (919) 678-1651. The Rolling Admission period will begin on January 1 of the High Performance Camp year, through the end of the application period in May of that year. Applications will be reviewed as they come in and will be provided an acceptance (or not) within a week. Similar to the Early Admission process, accepted applicants will be required to pay half the camp fee within 30 days of the notice of their acceptance to secure their slot. If an applicant is not accepted for camp initially, the High Performance Camp will make suggestions on enhancements that will improve chances for admission during the remainder of the Rolling Admission period. The Early Admission period opens up for the following year during the fall of the preceding camp’s year. Applicants will be informed of acceptance in early December and will be required to pay half the camp fee within 30 days of acceptance to confirm their slot. If a potential camper is accepted for Early Admission, they will receive a $200 discount as an incentive. If an applicant is not accepted for Early Admission, their application will still be considered for Rolling Admission and the High Performance Camp will make suggestions on enhancements that will improve chances for admission during the Rolling Admission process. Early Admission for the 2019 High Performance Camp closed on December 31, 2018. This outstanding camp is offered to Masters swimmers through the combined efforts of U.S. Masters Swimming, the Triangle Sports Commission, and the Greensboro Aquatic Center. The camp is organized and hosted by the Triangle Sports Commission. 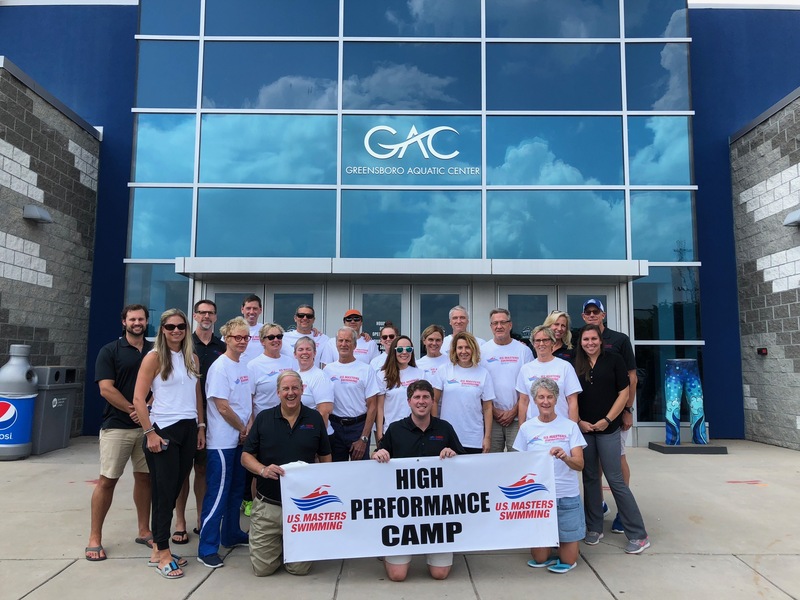 The camp, which celebrated its eighth anniversary in 2017, is limited to a small number of dedicated Masters swimmers who are committed to advancing their skills and performance. The camp is open to Masters swimmers who swim or train at an intermediate level or above. You’ll be taught and analyzed by outstanding USMS coaches and professionals in the fields of sports psychology, physiology, biomechanics, nutrition, technique, and resistance and flexibility training. Swimmers from across the U.S. and from Europe, South America, and the Virgin Islands have enjoyed the camp during its first seven years, and you can read an article about one swimmer’s experience at this amazing camp. • The camp emphasis is on testing and education. Pool time is dedicated to technique improvement rather than conditioning. You won’t be subject to high yardage, but you will get some quality workouts in! • You’ll be filmed above and below the water and have plenty of stroke instruction and analysis on all four strokes, starts and turns. • There will be testing for your heart rate and lactate threshold. • You’ll do the land water strength test and swim power test. • The camp also covers flexibility and range of motion assessment and instruction, as well as motivational and classroom presentations on topics such as biomechanics, physiology, sports psychology, nutrition, and race training. • We’ll keep you busy, but there will be plenty of opportunity for interaction and socialization with the other Masters swimmers. • You’ll learn the most up-to-date Masters training and competitive theories and techniques and be able to correlate them to your personal swimming program and goals. • Significant time will be devoted to providing individual results of, and feedback on, all testing. Biomechanic analysis of your stroke, body physiology, videotape review, flexibility and range of motion assessment results and recommendations, lactate and nutrition feedback, and recommendations will be included. • You will receive expert instruction and a critique of starts, turns, and drills. • You’ll take home computer printouts, handouts, videos, and test results, along with personalized training program recommendations. An enthusiastic, friendly, passionate, and dedicated group of coaches continue the tradition of offering high level coaching at this camp. • Any USMS registered Masters swimmer, as well as international Masters swimmers registered with the comparable governing body in their home country, is eligible to attend this camp. • Download the application to apply. Applications must be received by May 17, 2019 and you will be notified of your acceptance within a week. Once you are selected, the first payment is due within 30 days of notification of acceptance and the second payments is due by July 1 (the fee can also be paid in a single payment). For further information, contact Hill Carrow at hcarrow@trianglesportscommission.com. These new procedures are designed to give applicants more direction and certainty much earlier on in the process than previous, and to secure commitments for the camp sooner, rather than later, which aids in camp planning and delivery of a superior camp experience. For further information contact Hill Carrow: Click here for email or by fax at 919-678-1655. Check out this great article about the camp written by 2011 camper Glenn Gruber!